Last week I did a post on baby proofing you home and in that article I spoke about tethering your furniture to prevent young ones from being injured. There is a study out now that finds that more than 100 children visit those emergency departments each year with television tip over injuries. Parents need to be more aware of the hazards posed by televisions that can easily topple onto small children, say two Halifax researchers who conducted an unusual hospital study. Their study, which appears in the current issue of Paediatrics and Child Health, was sparked by the injury of a child they treated. “A little guy was playing at home just like all little guys do,” said Dr. Stephanie Dotchin of the IWK Health Centre in Halifax. The youngster required neurosurgery, spent months in hospital, and still has difficulty walking and speaking because of brain damage. Once the researchers started to look at televisions in the home, they also started to examine the sets within the pediatric hospital. After building a model that simulated a young child who are at an age most likely to climb and want to fiddle with a television, they found that it was actually quite easy to pull over TV sets in a pediatric hospital. Ninety per cent of the televisions were found to be tippable by a child four years of age or younger. Following the study, they were all made secure. “We’d like parents to be conscious that this is a risk in their homes and give thought to where they’re placing their televisions,” said Dotchin. The study suggests standards be set for the anchoring of televisions. Dr. Kevin Gordon of IWK’s pediatrics department noted that most TVs come with an anchor at the back that will fit into the console intended to be purchased with that brand of television. “TVs are getting larger and larger all the time, and so this is really getting to be even more of an issue,” she said. 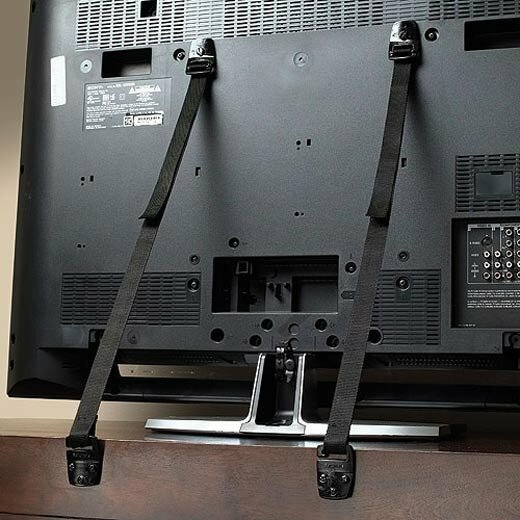 It is recommended that televisions be placed on stands that are lower to the ground, steady, and ideally brace or anchor them to the wall.